Have you ever looked around at your yard in dismay, wondering if you could ever make it look like your neighbor’s house or one of those homes in a magazine? Few people have the money to have full-time gardeners and landscape architects available at all times. If you have a limited budget and no clue where to get started on creating the yard of your dreams, a professional landscape designer can provide you help in a variety of different ways. 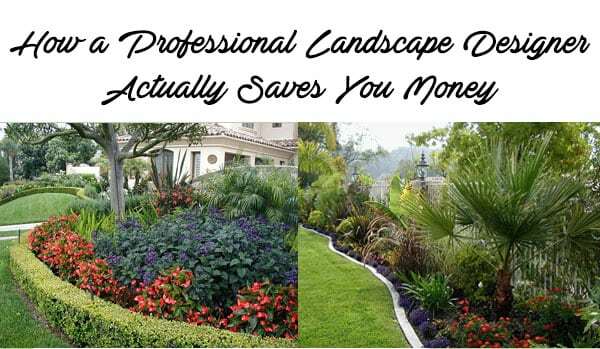 From helping you understand which plants are best for your California home to creating small wins that will make a big difference, working with a landscape designer will actually save you money in the long run. Anyone who has tried the DIY route on landscape design can tell you that sometimes there are some pretty dramatic failures. From wandering plants that take over the area and choke out everything in the surrounding space to plants that simply can’t work in the space you planted them. Doing it yourself doesn’t always save money. It’s not always possible to tell exactly how a plant will react to the California temperate zone until you’ve worked with that type of vegetation. A landscape designer understands the climate and the plants of the area and can help recommend items that will thrive in your space and look great both now and in the future. Is it better to put plants together that need lots of water and sunshine, or should they be scattered between plants that have lesser hydration requirements? A professional landscape designer can keep you out of trouble here. They’ll also help you understand which particular plants may be needier than others, demanding additional weeding, pruning or other maintenance that can be time-consuming and expensive. Your yard has a variety of micro-climates, and planting a particular type of greenery in one space may cause it to grow out of control. However, a slight shift to a different zone could make the same plant grow at a steady and healthy pace. Selecting the correct plants for each area keeps you from replanting and excessive maintenance, too. If your time is limited, a high-maintenance landscape design may even require you to hire someone for watering, trimming and other activities. A big issue in this area is irrigation, and California families can spend upwards of 50 percent of their water allotments for the year on keeping grass and other greenery…well, green! Professional landscape designers know which plants sip water and which are like bottomless pits that constantly need to be watered. They can also help design an irrigation system that will let you get the biggest benefit from your water bills and reduce waste. Plus, landscape design pros will understand what time of day particular plants should be watered (or not! ), and which will help you maintain plants that are healthier and hardier. Sustainability is incredibly important with the limited natural resources available. Landscape designers are able to evaluate soil type, the number of hours of sunlight and even drainage to create a sustainable yard and garden area for your home or office. Wouldn’t it be great if you could invest in a few gorgeous items that would “anchor” your design, which could be filled in by less-expensive plantings? Landscape designers have an eye for the elements such as drainage, lighting and how much air circulates around a particular area. They can visualize how a large accent planting, retaining wall, water feature or sculpture can provide drama to your landscape without breaking the bank. Even if you carefully sketch out the plan yourself, it’s a good possibility that you’ll have to make a change or discover something that will end up costing you more than expected. If nothing else, working with a landscape professional helps you fully understand the scale of your project so you can plan your budget appropriately. Perhaps you’re making an investment in your landscaping to make your home more appealing to potential buyers. Landscape designers can look at your home and yard holistically and work with you to hide any obvious flaws such as uneven windows, poorly-planned doorways and more with strategic placement of trees and shrubs. Your pro is also able to share advice on which items are most likely to boost the curb appeal and provide you with a positive return on your landscaping investment by allowing you to increase the asking price on your home. When there are similar homes in your area, the one with a better looking exterior is likely to gain a few extra points with potential buyers and realtors. Speaking of budget, it would be great to have unlimited funds and be able to do everything at once — but that’s rarely the case! Working with your landscape designer allows you to talk through some various possibilities based on the size of your budget and the time you have available for maintenance and upkeep. You may decide that you can complete several smaller parts of the project first before tackling a larger area. Your pro helps determine if there is a specific order to your plan that will help balance the budget and your time investment, while still showing an impact that your friends and family will definitely notice when they come to your home. Your landscape designer will help you step from your current situation to your dream yard in manageable steps. Hiring a professional landscape designer pays off by reducing your replanting costs, providing you with a lower-maintenance yard and keeping your budget in check. At Green Thumb Nursery, we definitely see the value of having a landscape designer on staff — we have two! Even better, check out our Lake Forest store’s free landscape design program and sign up for your very own free landscape design when you purchase $500 or more plants or products from Green Thumb. Check out examples of their stunning work online and request your consultation today by calling 949-837-3040. Don’t delay, this service is incredibly popular with our customers!